As some of you will recall, I was one of the Chairs for the European Patterns conference in 2008 and 2009. One of my responsibilities for the 2009 conference was to produce the conference proceedings. Well I’ve done it! 2009 represents a change for EuroPLoP. Until now we have published our proceedings in a physical book, a large book I should mention. This cost the conference organisers money (because it sold almost no copies), the money pushed up fees, and the proceedings were almost completely inaccessible unless you actually went to the conference. While some authors (like myself) put their papers online not everybody did. For 2009 this has all changed, we’ve gone electronic. Thanks to CEUR EuroPLoP 2009 proceedings are available for free to anyone who want them. You can download individual papers or everything as one 30Mb PDF file. So roll up, roll up, get your EuroPLoP 2009 conference proceedings here! While this goes some way validating my ideas its not the end of the story. 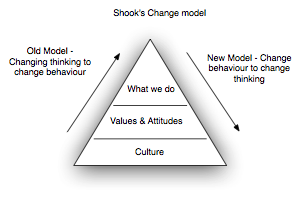 Shook goes further and suggests his model parallels Edgar Schein’s writing - Schein is an MIT Management professor who has written extensively on culture and organisations. Only later, are teams expected to reflect and modify their models - moving down the triangle/pyramid, moving from XP to Agile, to Lean, to a Learning Organization. As regular readers may recall (one of my favourite expressions!)... I regularly ponder my subscription to the MIT Sloan Management Review. After a few dull issues - which leave me wondering if it is worth the money - it has once again come up with an issue with a couple of articles which justify the price for the whole year. The article cites research to back up these assertions. This fits in well with what I tell teams when I’m coaching and training in Agile methods. The simple estimation and velocity measures I advocate are better than the complex models which are too often preferred. And it is no use asking a system expert (architect, senior developer, what-ever) how long it will take, their estimate is no better than anyone else. But, getting several different estimates (e.g. using planning poker or similar) is. One technique suggested by the article is something I’ve tried in “future-spectives.” You say to the team, or individual, “Imagine we are at the end of the project, we have finished on time, in budget, everyone is very happy, what did we do right?” and the opposite: “Another failed project, what did we do wrong?” Imagining yourself in that situation can produce useful insights. One of the ideas I talked about in my Jax London presentation is something I call the Scrum hegemony and it deserves a few notes. In many ways the Scrum people did a fantastic job of making Agile acceptable to the corporation. They had data and Harvard Business Review articles to cite, they didn’t ask the corporation to get into technical details (like TDD) and they had a friendly (English) name which avoided the word EXTREME! And most of all they had Certifications. O, don’t forget a pretty good marketing machine. All this had the effect of making Agile acceptable to suited corporate types who didn’t know the first thing about software development but knew projects were always late. 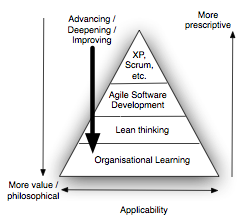 Ironically Scrum isn’t much more than XP, indeed, it is less than XP. Consider XP: you can basically divide it in two. The bits about engineering (continuos integration, test driven development, refactoring, etc.) and the bits about managing the work (iterations, stand-ups, stories, etc.). Scrum, as documented concerns itself with the management side. Granted Scrum expands on roles, Scrum adds some concepts like self-organising teams, adds some terms like backlogs and renames others (iterations to sprints) and adds burn-down charts but the management side of XP is basically Scrum, and Scrum is XP. Purists might like to argue about which stole from which but the point remains: they are the same. Scrum is devoid of the engineering practices, but as I’ve noted before in this blog: Scrum without the engineering practices is heading for trouble. XP’s success, and the even bigger success of Scrum had the unfortunate side effect killing off most of the other Agile methods: FDD, ASD, Crystal, etc. Pockets still exists (especially with DSDM) but that is all they are, pockets. That was good for understanding but bad for experimentation and learning. That’s now changing. The Scrum hegemony is now ending. Kanban, and perhaps other methods, are now offering alternatives. David Anderson’s Kanban insurrection is again offering an alternative. Kanban is again allowing the experimentation and variation in process that the Scrum hegemony has been stifling. Don’t get me wrong, I don’t think for one moment Scrum is going to roll over and disappear, or that Kanban will dominate. Scrum will continue to be the Agile method of choice for corporations, it will be the 800 pound gorilla to use a phrase. But it will no longer be the only show in town. Kanban is on the rise and drawing more attention to Lean, Software Craftmanship is on the rise and Tom Gilb’s work is being re-examined. There has long been a divide in Scrum between those who believe in “one and only one Scrum” and those who see “Scrum A, B and C” (I was going to post a link here to Jeff Sutherland’s blog but it appears he’s removed the post). Now there is a schism in Scrum: there are two bodies awarding Scrum certification, Scrum Alliance who’ve been around for a while and a Scrum.org backed by Microsoft and Ken Schwaber. One of the good things about Scrum was that it was clear about what it was and was not - unlike Agile. This increasingly looks in doubt. As Scrum has grown more popular variations have set in, differences in certification and types of Scrum only add to those differences. The danger for Scrum is that it goes the way of the word Agile and becomes all things to all men. That risk is echoed in the wider Agile family now. I welcome the rise of Kanban, not just because I think its a good system but because I think it is offering opportunities to think again about how we do things. But the end of the Scrum hegemony could leave the Agile as a whole fractured and incoherent, and decidedly not the type of thing corporations should be involved with. Worst of all, it could see a new methodology war. There would be no winners here, only looses. Scrum and Kanban, and all the other methods, shouldn’t be rivals just alternatives. Unfortunately between the method zealots and in the commercial market I fear that message will be lost. The slides from my Future of Agile presentation to this weeks Jax conference in London are now online. Although this talk started as a revision of last year’s Future of Agile (at ACCU and BCS Bristol) it ended up as a rewrite. The essential message is largely the same (key message: The future is lean) it brings out some new themes (e.g. software craftsmanship). Later this month I’m presenting longer version of this talk to the BCS PROMS-G group in London as part of their Agile spring school, itself a repeat of the Bristol BCS Spring School last year. The longer version will include more on how to go about changing from where you are today to where you want to be.